The descendants of indentured Indian immigrants and settlers who came to British Guiana between 1838 and 1928 constitute the largest group in the population. Today, they play essential roles in the economic, political and cultural life of the country. The Indian presence began with the arrival of indentured immigrants in British Guiana on May 5, 1838 primarily to work on the sugar plantations. There had always been a labour shortage in the sugar industry and planters anticipated that the emancipation of enslaved Africans would precipitate an exodus that could aggravate that situation. That did not quite happen. Nevertheless, indentured immigrants were brought from various European countries, the largest group being the Portuguese who had been recruited from Madeira and started arriving as early as May 1835. Three years after the start of Portuguese immigration and four months before African emancipation in August 1838, Indians started to arrive. Over the next nine decades, 239,909 Indian immigrants would arrive until the termination of the system in 1917; a few hundred others came up to 1928. Of these, 75,547 returned to India under the terms of their contract. The remainder who survived chose to make this country their home. The ethnic origins, occupational diversity and large number of Indians were important determinants of their own destiny and the development of the country. Many were recruited from the heavily-populated, Bhojpuri-speaking area that came to be known as the United Provinces − roughly the present-day Uttar Pradesh − and embarked at emigration depot at Calcutta (now Kolkota). Strong linguistic, demographic, cultural and religious bonds existed among them. The majority of immigrants came from the lower agricultural caste (including chamar); artisan caste (kumhar); cultivator caste (kurmi); grazier caste (ahir); landholding caste (thakur), and priestly caste (brahmin). There were also significant numbers of muslims and outcasts. Owing to the relative shortage of women immigrants in the early days, there was a degree of miscegenation; some men married or cohabited with African women producing children of mixed blood referred to as ‘douglas.’ Today, it is estimated that there are 325,000 Indians, making up 43.5 per cent of the population in Guyana. About 125,000 persons are mixed, many of them douglas. Living and working conditions on the plantations as labourers and engaging in inter-caste, inter-religious and inter-racial marriage made it difficult to maintain ethnic exclusivity. Some persons also changed their names making it impossible to trace their original caste. …rice cultivation; cattle farming; growing provisions; jobbers about town; grass-cutters; gardeners; grooms; jockeys; fishermen; cabmen; cartmen; milk-sellers; tramcar-drivers; hucksters; merchants; mechanics; clerks; barbers; boatmen; tailors; rope-makers; charcoal-burners; goldsmiths; workers in clay; domestic servants; manufacturers of coconut oil; sweetmeats-vendors; boxwallahs [peddlers]; bakers; chemists; shopkeepers. According to Basdeo Mangru, by the first quarter of the 20th century, there were already 238 Indian jewellers; 445 shopkeepers; 845 hucksters; 259 milk-sellers; 12, 465 rice farmers and 13, 700 landed proprietors, agriculturists and cattle farmers. Indian indentured labourers in the late 19th and early 20th centuries successfully transplanted their skills from their old homes onto their new. In so doing, they not only displayed a high occupational profile in a number of non-plantation, economic activities but helped to diversify the economy of this country. The Indian presence was cemented in the country by the colonial administration’s decision to establish exclusive land settlement schemes. After the first 30 years of the indentureship system, it was calculated that about 30, 000 immigrants were entitled to free return passages to India at a cost of $250,000 after their contracts had expired. Within a decade, the number of claimants, and the cost of their passages, had doubled. In order to avoid their responsibility, the planters and the colonial administration developed a number of land settlement schemes – Nooten Zuil and Helena on the East Coast Demerara; Huis ’T Dieren on the Essequibo Coast; Maria’s Pleasure on Wakenaam Island; Bush Lot on the West Coast Berbice; Whim on the Corentyne Coast – to lure the immigrants into accepting land in lieu of their return passage. 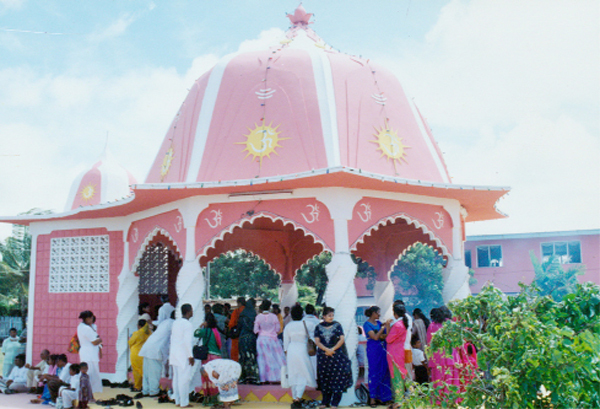 This, perhaps, was the most significant factor in the permanent settlement of Indians in Guyana. Others, through thrift, were able to buy freehold land on their own when they left the plantations. As most immigrants had come from agricultural castes, they were able to embark on rice and coconut cultivation and animal husbandry on small holdings as independent peasants. By the end of the 19th century, Indians dominated coconut and rice industries and cattle and dairy farming. The food shortage created by the First World War firmly established Indian-grown rice both as a domestic staple and a major export commodity. This was nothing less than the start of an agrarian revolution that transformed both the economy and society. Landowners and millers became an extremely rich élite largely through high interest and land rental rates. New occupations such as money lending – dominated by the bania business caste and taking advantage of the absence of banks – sprung up. Others became rich as jewellers by melting down silver coins to be made into personal ornaments as jewellery but which also stored the family’s wealth. From among them, the Indian middle class emerged and eventually embraced the values of colonial society, at least in part. A significant minority of the socially mobile adopted Chris-tianity, opened enterprises in Georgetown and New Amsterdam and sent their sons to be educated as professionals – especially as accountants, attorneys and medical doctors – in the United Kingdom. Resaul Maraj, Joseph Jaikaran, Francis Kawall, Charles Jacob; Hussain Baksh Gajraj were among the pioneers and stalwarts of the new Indian commercial community. From the first quarter of the 20th century, this middle class began to make its presence felt as a significant political, economic and social force. Indians were largely absent from the political scene throughout the indentureship period. By 1925, although Indians had increased to 40 per cent of the population, they comprised only 13 per cent of registered voters. Gradually, they became more organised in politics and society. At the political level, eligibility to vote in the early 20th century was determined by literacy in the English language, income, age, citizenship and property qualification. Rich, educated members of the emergent élite were therefore best positioned to exploit the opportunities for political advancement. Joseph Alexander Luckhoo, an attorney-at-law and scion of the large Luckhoo clan, was the first Indian elected to the Combined Court (the forerunner of the National Assembly). His brother, Edward Alfred, a solicitor, was elected in 1926. Three Indians – E.A. Luckhoo, A.E Seeram and J.B. Singh were elected in 1931. Later, Peer Bacchus, C. R. Jacob, A.M. Edun and others followed their lead. Given the restricted franchise, it is evident that voting did not take place on racial lines and they had to win the support of eligible African, Chinese and Portuguese electors of the day. By the time that Dr Cheddi Jagan was elected to the Legistative Council in 1947, therefore, a tradition of Indian legislative representation had already existed for over 30 years. The most important political phenomenon, perhaps, was the founding of the People’s Progressive Party in 1950 and the introduction of universal adult suffrage in the ‘Waddington Constitution’ of 1952. Cheddi Jagan became leader of the party’s legislative group and, eventually, the most beloved Indian-Guyanese of all time. But he was not without rivals. Numerous attempts were made to establish parties based almost exclusively of Indian ethnic support. Lionel Luckhoo, at one time President of the Manpower Citizens’ Association – then the main labour union in the sugar industry – established the National Labour Front aimed at winning the support of Indian sugar workers and farmers; Balram Singh Rai and Jai Narine Singh formed the all-Indian Justice Party and Hoosein Ghanie, the Guiana United Muslim Party, in 1964. More recently, Ravindra Dev formed the Rise, Organise and Rebuild Guyana movement which won a seat in the 2001 General Elections. Today, after 59 years, the People’s Progressive Party is still the dominant political force in the Indian community and is likely to remain so in the foreseeable future. At the labour level, since the Indian immigrants came largely as labourers, the plantations became the anvil on which their relations with European planters were hammered out, usually over disagreements about wages and working conditions. There were over 600 strikes which resulted in assaults on managers, overseers and drivers and the deaths of 50 labourers, within the first hundred years of plantation labour. The first major strike occurred at Leonora in 1869. This was followed by violent clashes throughout the sugar belt – at Hague; Uitvlugt; Mon Repos; Non Pareil; Zeelugt; Vergenoegen; Success and, finally, at Devonshire Castle in September 1872. In the 20th century, strikes continued at Friends, Rose Hall, Ruimveldt, and again at Leonora. It was partly as a result of these frequent disputes and disturbances that Ayube Mohamed Edun established a labour union – the Manpower Citizens’ Association – mainly for Indian sugar workers. Registered in November 1937, within five years, its membership soared to 20,000. For decades thereafter, the MPCA’s dominance in the industry was challenged first by Joseph Lachhman-singh’s Guiana Industrial Workers’ Union in the 1940s and, from the 1960s, by the Guyana Agricultural Workers Union until its influence in the industry was shattered. At the social level, the British Guiana East Indian Association, aimed at highlighting the plight of Indians, was established in 1916 largely through the efforts of Joseph Ruhoman. Over the next thirty years, several other organisations – Susamachar East Indian Young Men’s Society; Balak Sahaita Mandalee (Children’s Welfare Society); Dharamsala; British Guiana Dramatic Society, and the East Indian Cricket club, among others – were established largely under the leadership of prominent persons in the growing middle class. Religion has always been central to Indian society. According to Tota Mangar, approximately 83 per cent of the immigrants who came were Hindus, about 14 per cent were Muslims and 3 per cent were Christians. Plantation managers and the colonial administration encouraged Indian religion by permitting free time for the celebration of some festivals such as Holi, and by providing building materials for the construction of mandirs for the Hindus and masjids for the Muslims. As a result, by 1920, there were already about 50 of each throughout the coastland. 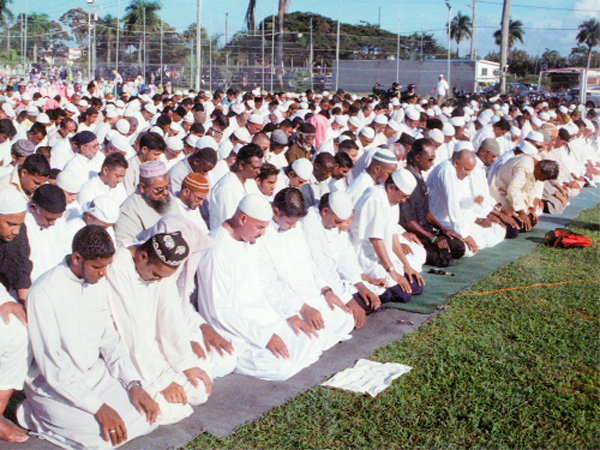 Several religious organisations, most prominently the British Guiana Sanatan Dharma Maha Sabha and the Sad’r Anjuman E-Islam were established in 1927 and 1937, respectively. Attempts to evangelise Indians in the 19th century, especially by Anglicans and Presbyterians, had only modest results. Gradually, however, Christianity took hold and by the 1990s, several Pentecostal and other churches of other denominations sprouted in the countryside. By 1972, Benedict Singh, a priest of Indian origin, was appointed Roman Catholic Bishop of Guyana. Indians have left a rich legacy of art, dance, literature and music. Traditional cuisine – the perennially popular curry, puri, roti, bara, kheer – and other vegetable dishes, are widely consumed. Festivals, including the colourful Holi, Diwali, Youman Nabi and Eid-ul-Fitr are today national holidays. Traditional Indian wear – the shalwar, sari, kurta – though no longer everyday wear, have remained very popular especially at festivals, weddings and religious ceremonies. The contributions to sport, especially in the present day feats of Shivnarine Chanderpaul and Ramnaresh Sarwan, have become national legends. The last shipment of immigrants – consisting of 437 persons and originating from both Madras and Calcutta – arrived on April 18, 1917 aboard the S. S. Ganges formally terminating the Indian indentureship system. Nevertheless, over 400 immigrants were brought on contracts to work on the sugar plantations in 1921-1922 and several others also came as ordinary settlers. Immigration from India ended in 1928 after almost exactly 90 years. The Indian presence has immeasurably enriched the Guyanese nation. Descendants of indentured labourers continue to contribute to the cultural, economic and political life of the country.